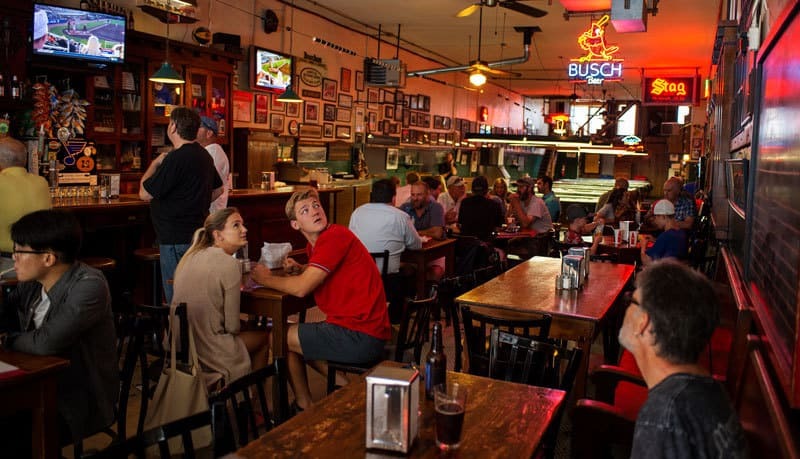 Parents returning to Columbia for a football game or to drop their college students off for the semester might stop by Booches on 9th Street for the nostalgia. The place oozes with it. But it’s not the nostalgia that brings in the students and other regulars. They come here for burgers, beer and good times. And they have been coming in steadily since 1884, when Booches first opened its doors a few blocks from its current location in downtown Columbia. That’s so long ago that it’s likely that Civil War veterans were among those who sat down for a beer in Booches’ original location. That was more than a generation before horseless carriages replaced horses. And just eight years after Academic Hall burned down, leaving only the six columns behind. Some legacy businesses survive because their owners consciously try to change with the times. Rick Robertson, co-owner of Booches, has taken a different approach. He takes pride in keeping things the same. 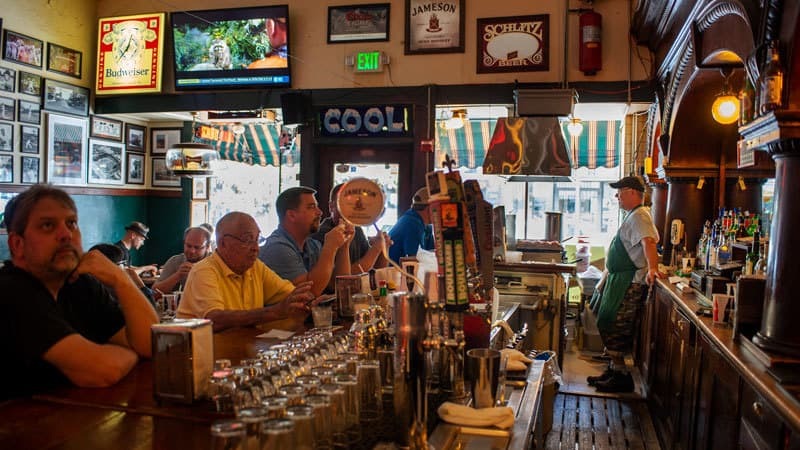 The grilled burgers served on wax paper, the bag of potato chips instead of fries, the draft beer — the menu today is the same as last year’s and will remain the same next year, and the years after that. Robertson is as comfortable behind the bar at Booches as if he were sitting in front of it on a bar stool along side of his customers. On a recent morning, he was dressed in camouflage pants and matching cap, along with a blue t-shirt, complete with Booches’ logo. He’a a big guy, the sort of person who would look out of place in a sport coat at a desk or walking the halls of an office. Robertson is the definition of casual and comfortable, as is Booches. Robertson has a long history with Booches. He started working there back in the 1990s, then bought the place with Charlie Kurre in 2004. The time he spent as an employee gave him the experience and confidence to own the business. But it also gave him an appreciation of Booches’ history, and that history is a big part of what he enjoys about owning the business. Although his work day is similar to most restaurant owners, Robertson understates the results of his work. The quality of Booches burgers is legendary and national in scope. TV’s Cooking Channel published Booches’ burger recipe recently. And back in 2000, USA Today honored it as one of the top 25 burgers in the nation. The food might be the only thing that changes at Booches. The wooden tables and chairs are at least a quarter of a century old. The white tile floor is a prime example of early 20th Century craftsmanship. Dark wooden arches create a vintage look and feel to the bar. Old wooden benches line the walls next to the pool tables. There’s even a payphone on the wall. “The phone company wanted to take it out, but I got them to leave it alone,” Robertson says. The phone works for free local calls but doesn’t take quarters any longer. Like Booches, it’s a piece of the past that Robertson is doing his best to preserve. Click on each photo below to read about these local legacies.